My normal format for movie reviews will be changed for this review only because I watched the English dubbed version of the animated film and can’t find a listing of the voice actors anywhere. Another reason why this review is difficult for me is because apparently the movie is based off an original version of the movie (originally a show/manga/comic (not sure, didn’t do too much research)) Thus, some of the story and characters were an homage to the fans of the original series and hard to comprehend for a newcomers point of view. The actors lending their English dubbed voices to the mix were actually one of the highlights of the movie. The voice of Harlock and Logan were exceptionally done. I wish there was more to say on this content (I should have watched it with the original Japanese voices in retrospect). Most of the characters were really well thought out with decent backstory (with what they gave us at least). Logan is a young man who has spent his entire life looking to the skies. He’s been looking forward to traveling with the great Captain Harlock. At least, that’s what they want us to believe. I understand many characters in all mediums have life changing decisions made either for them or by them. I also understand that characters will change their views and beliefs on certain subjects based on the level of influence around them. However, Logan spends too much time changing between what he thinks is right and what he thinks is wrong far too often. Something miniscule will happen and he changes his views on the subject and five minutes later is lecturing another on the topic. I am all for an indecisive individual but Logan takes it a bit too far sometimes. Harlock, on the other hand, is a very decisive individual. He understands exactly why he does what he does and he’s not shy about it. From the small bits of backstory they provide for him, it’s easy to tell why he’s such a badass. The plot for the movie is as follows with no spoilers: space travel was invented, everybody left Earth to explore (Firefly? ), they spread out too thin, they wanted to return, there was a war called the “Homecoming War” (My friend and I debated this stupid war for a good twenty minutes), an agency called the Gaia Coalition was formed, travel back to Earth was prohibited, Harlock attacks the Coalition’s ships and is the most wanted fugitive out there. Enter Logan. Logan wants entry to the ship. The question is, why? Begin movie. Most of the movie was fairly straight forward but there were many moments where I questioned what was going on and asked myself “what the hell is going on?” Most of it made sense by the end but there were many questions left unanswered. 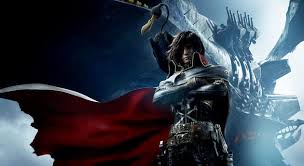 I ended up googling past stories of Captain Harlock just to get a lock on what I had just watched. I ended up finding the actual explanation of the movie and what the creators intended. Let’s just say it’s confusing and not worth the struggle unless you’ve been involved with the series since its early days. The animation is spectacular. It’s not Pixar/DreamWorks spectacular but then again, it’s an Anime movie and the animation fits in perfectly with the theme and foundation of the movie. I have zero complaints about the animation (even going so far as to say my jaw dropped at some of the scenes in the movie). The movie was enjoyable. If you put aside the complicated, convoluted plot, weird character development (or lack thereof for a majority of the characters), and confusing storytelling, you’ll enjoy the movie. Basically, don’t watch it. Posted in Reviews.Tagged animation, anime, captain, characters, harlock, movie, pirate, plot, review, space, space pirate captain harlock, spoilers.